January 2015 n Performance & Hotrod Business n 29 Modules are definitely our hottest product heading into 2015. These in-tank fuel sys- tems bring our popular external fuel pump technology inside the fuel tank. Developed for racing and capable of street use, these fuel systems can provide fuel for up to 1,800 hp." Compatible with gasoline, E85, metha- nol and diesel fuels, the pumps "eliminate risky multi-pump hangers and reduce cost and installation time," he adds. "Vehicles previously considered problematic because they are hard to sump, have saddle tanks or not enough room for an external pump now have a viable, simple and reliable solution." Fickler notes universal applications are selling well. 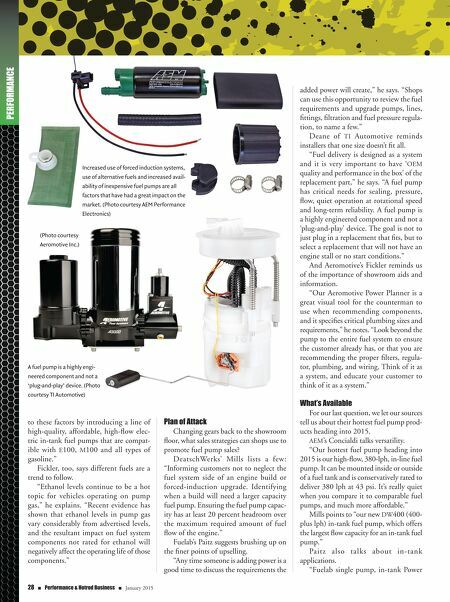 "Our entire line of Phantom Universal Pump and Sump systems is very hot, as signified by the latest edition, our Phantom Flex, winning the Best New Product–Street Performance at the 2014 SEMA Show. 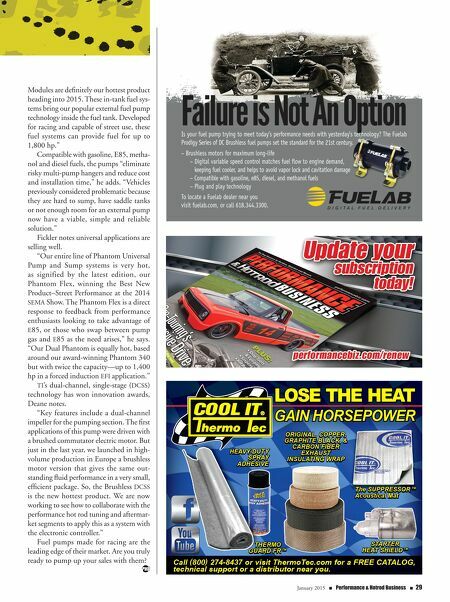 The Phantom Flex is a direct response to feedback from performance enthusiasts looking to take advantage of E85, or those who swap between pump gas and E85 as the need arises," he says. "Our Dual Phantom is equally hot, based around our award-winning Phantom 340 but with twice the capacity—up to 1,400 hp in a forced induction EFI application." TI's dual-channel, single-stage (DCSS) technology has won innovation awards, Deane notes. "Key features include a dual-channel impeller for the pumping section. The first applications of this pump were driven with a brushed commutator electric motor. But just in the last year, we launched in high- volume production in Europe a brushless motor version that gives the same out- standing fluid performance in a very small, efficient package. So, the Brushless DCSS is the new hottest product. We are now working to see how to collaborate with the performance hot rod tuning and aftermar- ket segments to apply this as a system with the electronic controller." Fuel pumps made for racing are the leading edge of their market. Are you truly ready to pump up your sales with them?